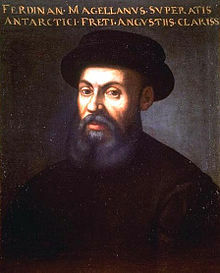 Ferdinand Magellan was a Portuguese explorer who became known for having organised the expedition that resulted in the first circumnavigation of the Earth completed by Juan Sebastian Elcano. Magellan’s expedition of 1519–1522 became the first expedition to sail from the Atlantic Ocean into the Pacific Ocean, and the first to cross the Pacific. His expedition completed the first circumnavigation of the Earth. 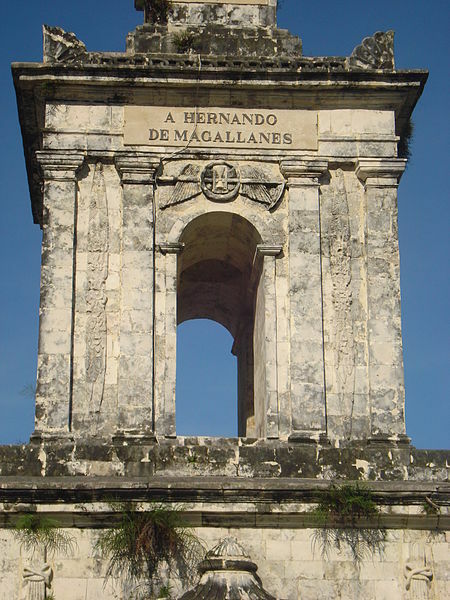 Magellan did not complete the entire voyage, as he was killed during the Battle of Mactan in the Philippines. Magellan was born around 1480 either at Vila Nova de Gaia, near Porto, in Douro Litoral Province, or at Sabrosa, near Vila Real, in Tras-os-Montes e Alto Douro Province, in Portugal. After the death of his parents during his tenth year, he became a page to Queen Leonor at the Portuguese royal court because of his family’s heritage. In March 1505 at the age of 25, Magellan enlisted in the fleet of 22 ships sent to host D. Francisco de Almeida as the first viceroy of Portuguese India. Although his name does not appear in the chronicles, it is known that he remained there eight years, in Goa, Cochin and Quilon. He participated in several battles, including the battle of Cannanore in 1506, where he was wounded. In 1509 he fought in the battle of Diu. He married a woman from Amboina and became a military advisor to the Sultan of Ternate, Bayan Sirrullah. His letters to Magellan would prove decisive, giving information about the spice-producing territories. After taking a leave without permission, Magellan fell out of favour. Serving in Morocco, he was wounded, resulting in a permanent limp. He was accused of trading illegally with the Moors. The accusations were proved false, but he received no further offers of employment after 15 May 1514. Later on in 1515, he got an employment offer as a crew member on a Portuguese ship, but rejected this. In 1517 after a quarrel with King Manuel I, who denied his persistent demands to lead an expedition to reach the spice islands from the east (i.e., while sailing westwards, seeking to avoid the need to sail around the tip of Africa), he left for Spain. In Seville he befriended his countryman Diogo Barbosa and soon married his daughter by his second wife Maria Caldera Beatriz Barbosa. They had two children: Rodrigo de Magalhaes and Carlos de Magalhaes, both of whom died at a young age. His wife died in Seville around 1521. The expedition was funded largely by the Spanish Crown, which provided ships carrying supplies for two years of travel. Expert cartographer Jorge Reinel and Diogo Ribeiro, a Portuguese who had started working for Charles V in 1518 as a cartographer at the Casa de Contratación, took part in the development of the maps to be used in the travel. Several problems arose during the preparation of the trip, including lack of money, the king of Portugal trying to stop them, Magellan and other Portuguese incurring suspicion from the Spanish, and the difficult nature of Faleiro. Finally, thanks to the tenacity of Magellan, the expedition was ready. Through the bishop Juan Rodríguez de Fonseca they obtained the participation of merchant Christopher de Haro, who provided a quarter of the funds and goods to barter. On 10 August 1519, the five ships under Magellan’s command left Seville and descended the Guadalquivir River to Sanlucar de Barrameda, at the mouth of the river. There they remained more than five weeks. Finally they set sail on 20 September. King Manuel I ordered a Portuguese naval detachment to pursue Magellan, but the explorer evaded them. 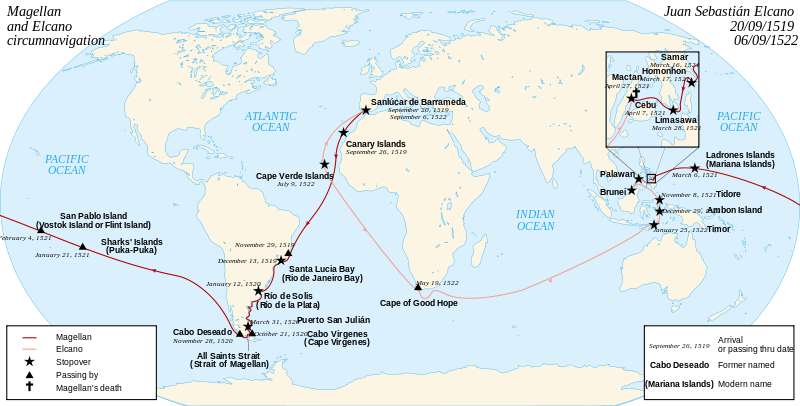 After stopping at the Canary Islands, Magellan arrived at Cape Verde, where he set course for Cape St. Augustine in Brazil. On 27 November the expedition crossed the equator; on 6 December the crew sighted South America. As Brazil was Portuguese territory, Magellan avoided it and on 13 December anchored near present-day Rio de Janeiro. There the crew was resupplied, but bad conditions caused them to delay. Afterwards, they continued to sail south along South America’s east coast, looking for the strait that Magellan believed would lead to the Spice Islands. The fleet reached Río de la Plata on 10 January 1520. For overwintering, Magellan established a temporary settlement called Puerto San Julian on March 30, 1520. On Easter (April 1 and 2), a mutiny broke out involving three of the five ship captains. Magellan took quick and decisive action. Luis de Mendoza, the captain of Victoria, was killed by a party sent by Magellan, and the ship was recovered. After Concepcion’s anchor cable had been secretly cut by his forces, the ship drifted towards the well-armed Trinidad, and Concepcion’s captain de Quesada and his inner circle surrendered. Juan de Cartagena, the head of the mutineers on the San Antonio, subsequently gave up. Antonio Pigafetta reported that Gaspar Quesada, the captain of Concepcion, and other mutineers were executed, while Juan de Cartagena, the captain of San Antonio, and a priest named Padre Sanchez de la Reina were marooned on the coast. Most of the men, including Juan Sebastian Elcano, were needed and forgiven. Reportedly those killed were drawn and quartered and impaled on the coast; years later, their bones were found by Sir Francis Drake. 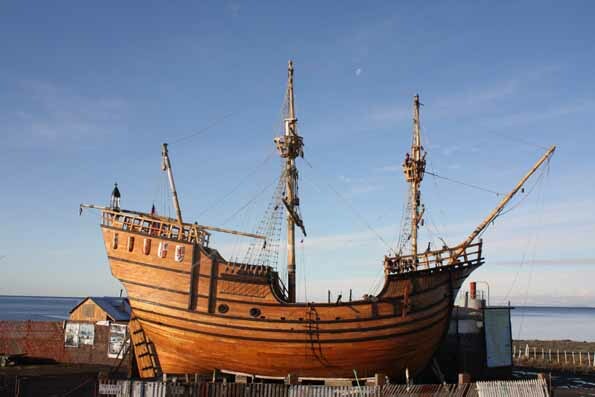 A replica of the Victoria can be visited in Puerto San Julian.